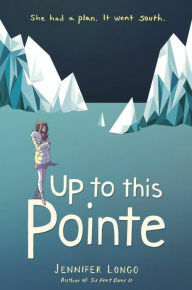 When her life plan of getting a position as a professional ballerina fails, Harper Scott decides to flee as far away from San Francisco as she can go. She ends up at McMurdo Station in Antarctica, following in the footsteps of her distant ancestor, Robert Scott. It's the winter and a brutal time to be in the harshest environment on Earth. But the isolation and climate suits Harper. Told through alternating chapters of her earlier failure at home and of her search for healing in the present, the novel is an engaging story of failure and reinvention. There is a terrible melodramatic potential to the idea that a young person can be so wrapped up in a childhood dream that they fall apart -- so much potential in fact that it is instinctive to not take her seriously. But as the story unfolds, it becomes clearer how deeply embroiled she was and why it was possible for her to be so devastated. And, by the end, Longo had convinced me that Harper had truly suffered. The rest was easier. Strong and interesting characters, fascinating details about ballet and Antarctic life, a surprisingly effective Shakespearean plot device, and an engaging story made this a fun read. The ending is bit too cheery and happy, but it felt earned (so I'll let it mostly slide! ).